This article is a short summary of The Legend of Zelda. This article is about the game. For information about the series, see The Legend of Zelda. The Legend of Zelda is an adventure game originally released as a launch title for the Famicom Disk System in Japan in 1986 and later released for the standard Nintendo Entertainment System hardware in other regions the next year. As the first installment of The Legend of Zelda series, this game was given a direct sequel, titled Zelda II: The Adventure of Link, also released for the NES/Famicom Disk System in 1987/1988. 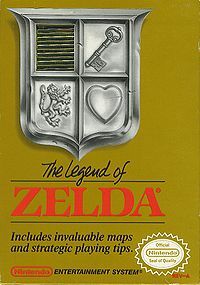 Original NES copies of the game at retail were packaged with a partial map of the game's overworld and a strategy guide. Experience the original smash-hit adventure on the NES! Ganon, the King of Evil, has broken free of the Dark World and has captured Hyrule's beloved Princess Zelda. But, before she was caught, Zelda managed to shatter the Triforce of Wisdom and scatter its eight pieces throughout Hyrule. You begin your adventure by finding a small wooden sword in a dark cave. Then, as you grow in stature, experience, and strength, so do your weapons. Help Link collect the captured pieces of the Triforce, rescue the princess, and thwart Ganon's evil plans! The Legend of Zelda is a top-down adventure game in which players control Link, journeying around the land of Hyrule. Players can go to each of the eight dungeons in any order, in which players must solve puzzles to collect items or upgrades for Link, reach and defeat the boss and collect one of the eight fragments of the Triforce of Wisdom. After clearing the eight dungeons players can access the ninth level to fight Ganon. On the overworld are a number of hidden areas in which players can find Rupees for money, items or shops to buy items, and Heart Containers to increase health. The Legend of Zelda is one of the earliest NES games to have a save feature via battery backup, allowing players to save their game when they game over, or at any point by pausing and pressing up and A with a second controller. After clearing the game, the player has the option to play "Second Quest", a more difficult game in which the dungeons are redesigned and enemies are stronger. THE HYRULE FANTASY ゼルダの伝説 1 (The Hyrule Fantasy: Zeruda no Densetsu 1) Family Computer JP: 1994 A re-release of the game in Japan for the Famicom cartridge format, using a slightly modified version of the NES cartridge version of the game. AUS: 2004 A collection of ports of four previous The Legend of Zelda titles, including this one. Classic NES Series: The Legend of Zelda / Famicom Mini: Zeruda no Densetsu Game Boy Advance 2004 A direct port of the game released for Game Boy Advance. KR: 2009 A direct port of the game released as a digital download on the Wii Shop Channel. A direct port of the game released as a digital download on the Nintendo eShop for Nintendo 3DS, allowing for special emulator features. The Legend of Zelda Wii U (Virtual Console) 2013 A direct port of the game released as a digital download on the Nintendo eShop for Wii U, while allowing players to use special emulator features. ↑ The Legend of Zelda North American English manual, pp. 3-4. This page was last edited on 3 November 2018, at 23:04.